If you come to Madrid with children, they will love having a couple of afternoons just for them. So many museums, day trips and walks deserve a prize! In Madrid there are many things to do with children. As well as enjoying the Teleférico (cable car) and the Zoo, all year long you can find theatre shows just for children, where magic, fantasy and the most surprising stories ever told come to life. 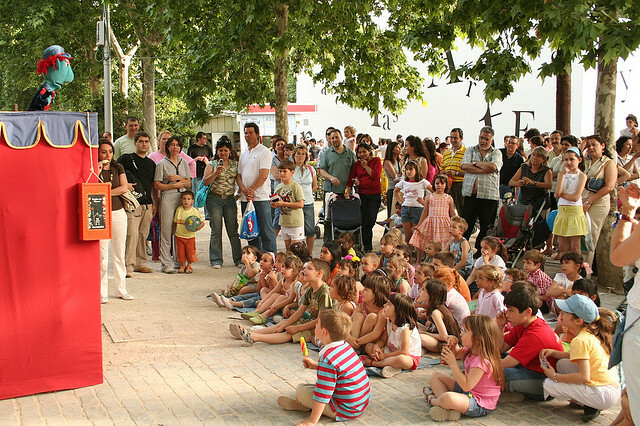 San Pol is the only theatre in Spain that focuses entirely on children’s shows. For over 30 years they have staged shows among which we can find their own productions, classic performances and magic and puppet shows. The shows for the general public are on Saturdays at 5.30pm and Sundays and holidays at 12pm and 5.30pm. Tickets range between 12 and 14 euros. In the park of El Retiro we can attend this puppet show set up in the open air behind the gardens, on Avenida de México. It is famous in Madrid since they have been entertaining children and adults with their shows for more than 20 years. The shows are free and you do not need to book in advance. The programme is on the weekends and the timetables vary depending on the time of year. In autumn-winter (October to March), they start at 12.30pm and in spring-summer (April to September) at 6.30pm. In July and August they stage the Titirilandia Festival, a festival that has been showing special shows for the youngest ones since 1993. Another scenic space with many options for children is La Escalera de Jacob, which mainly offers magic shows adapted for children. Its programme is varied, with up to 9 shows for children on at the same time and the prices range from 4 to 6 euros.